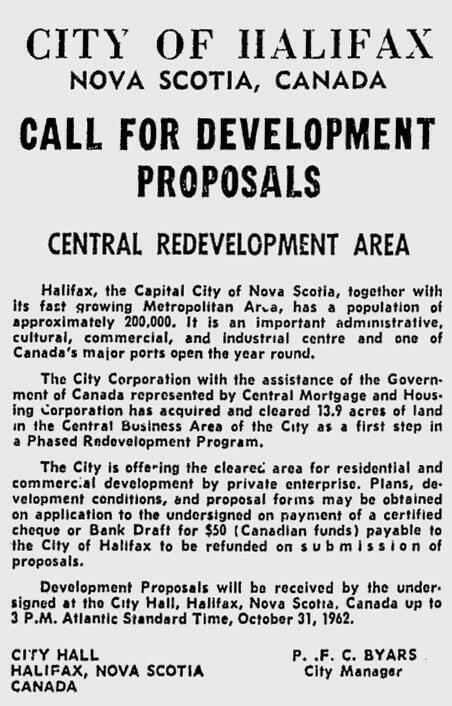 The City of Halifax places advertisements in newspapers asking for proposals to develop the Central Redevelopment Area in the downtown. The city indicates it has cleared 5.6 hectares of land for residential and commercial development. An advertisement from The Montreal Gazette - April 13, 1962. 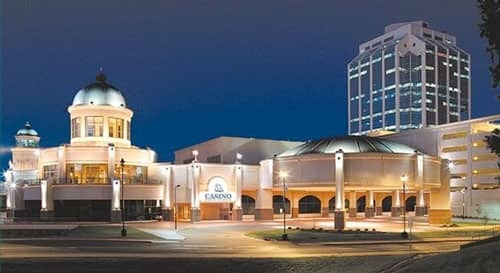 The City of Halifax, the Central Mortgage and Housing Corporation and Halifax Developments Limited make a development agreement for Scotia Square, a redevelopment of 5.6 hectares of land in the downtown area involving the construction of apartment buildings, a trade mart building and a hotel. This is a model of a prototype for what eventually became Scotia Square. The model is currently at the Nova Scotia Archives. Officials with the Scotia Square development make it clear the city’s transportation infrastructure would need to keep up with the number of people expected to be brought in to the downtown area by the Scotia Square complex. 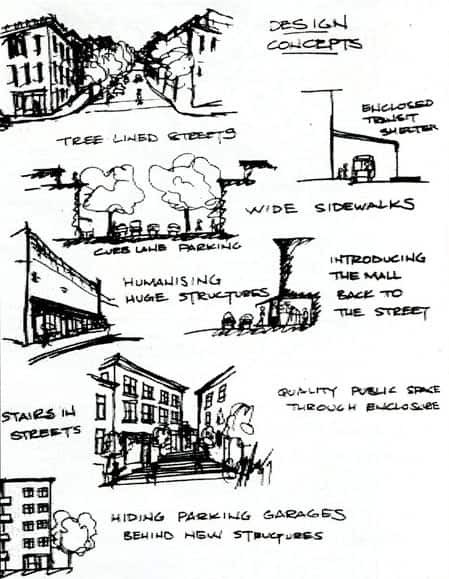 DeLeuw, Cather & Company propose the construction of a multi-lane service road that would run through the Central Redevelopment Area to increase the capacity for cars in the downtown. The company refers to this road as the Waterfront Distributor — it also came to be known as Harbour Drive. Photo: Courtesy of Graeme Duffus. The City of Halifax hires Toronto-based A.D. Margison & Associates, a consulting engineering firm, to design the Cogswell Interchange and Harbour Drive. They envision a six-lane expressway to run along the waterfront on the peninsula and provide traffic access to the downtown core — much like the Gardiner Expressway in Toronto. The Gardiner Expressway, incidentally, was planned by an engineering firm called Margison, Babcock and Associates — a firm that dissolved in 1954 and eventually became A.D. Margison & Associates. 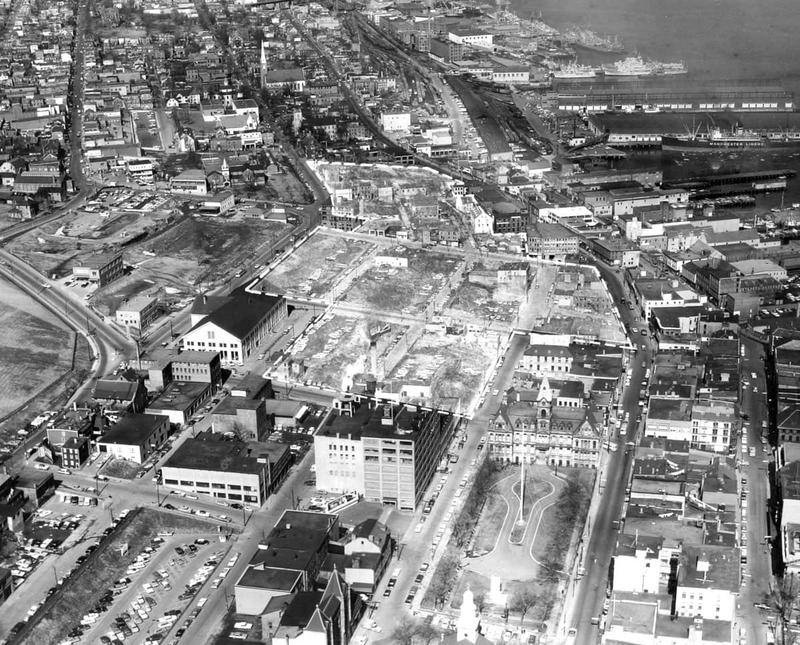 See Barrington Street and downtown Halifax before the Cogswell Interchange was built. 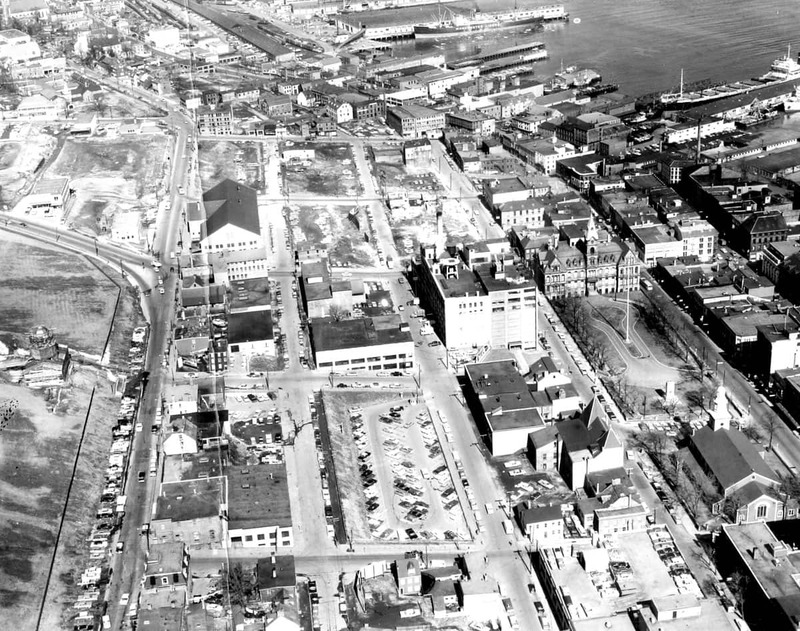 The construction of Harbour Drive, as it was originally designed, would have necessitated the demolition of all historic and other buildings east of Barrington Street between Prince and Proctor streets. The Nova Scotia Association of Architects, led by Allan F. Duffus, opposes the Cogswell Interchange and Harbour Drive proposals and argues against the demolition of historic buildings in downtown Halifax. Courtesy of The Chronicle Herald - November 2, 1967. Amid discussions on what to do about the Cogswell Interchange, Mayor Allan O’Brien sends a letter to the members of city council outlining his priorities. “There is, as our experience shows, a risk in accepting conceptual designs when angles, profiles and measurements are unknown,” he writes. 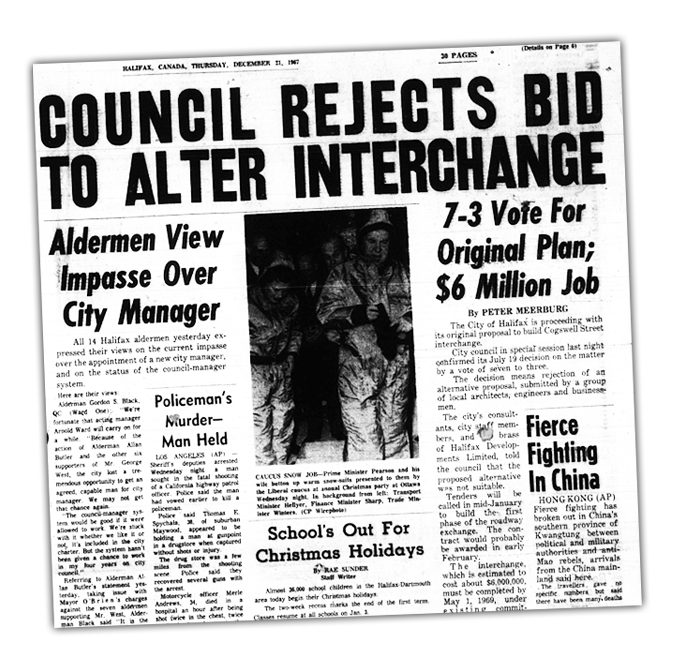 Letter to council from mayor - November 22, 1967. 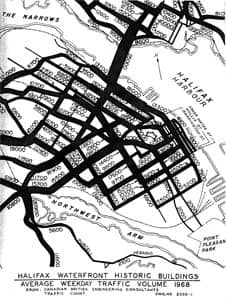 The City of Halifax asks A.D. Margison & Associates to examine the feasibility of an alternate plan presented by Allan F. Duffus and others opposed to the proposed Cogswell Interchange and Harbour Drive project. 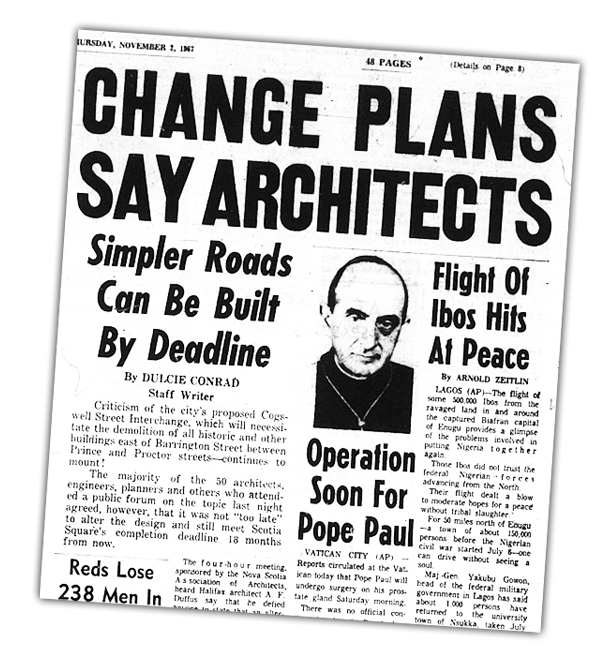 A.D. Margison & Associates concludes its own design is best and says the alternate proposal will overload the streets with traffic by 1970. The firm’s experts say Duffus’s planned road will need to be widened soon after it’s constructed, resulting in negligible cost savings. 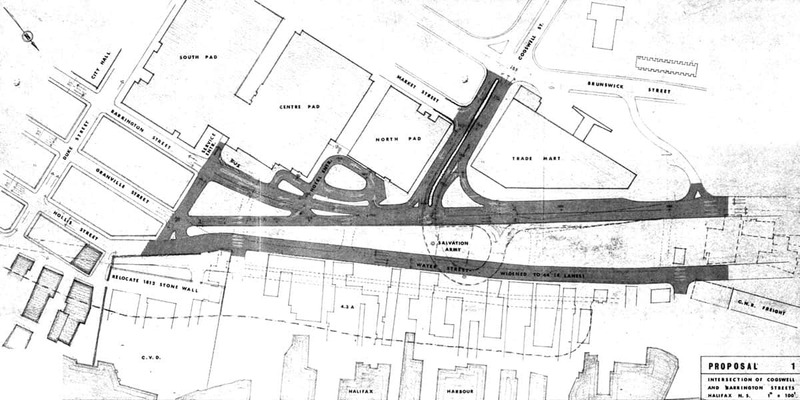 The street view of the future Scotia Square, using the road plan envisioned by Allan Duffus. 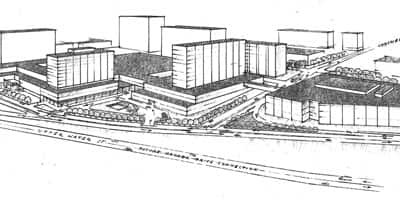 The bird's-eye-view sketch of Allan Duffus's proposal. Architect Graeme Duffus talks to reporter Pam Berman about how his father, the late architect Allan Duffus, tried to fight the Cogswell Interchange. Graeme Duffus details his father's alternate plans for the area, shown above. The City of Halifax rejects the alternative proposal from local architects, engineers and businessmen to change the proposed Cogswell Interchange. City council at the time was concerned delaying or changing the Cogswell Interchange project would hurt the tenancy agreements that had been made in the Scotia Square development — the construction of which was dependent on the creation of the interchange. Courtesy of The Chronicle Herald - December 21, 1967. 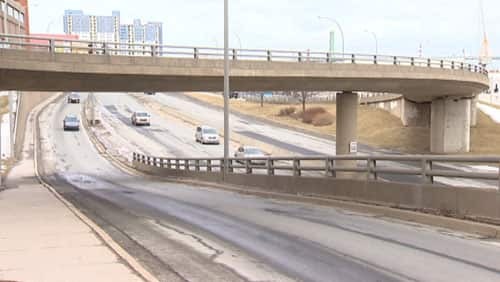 City council approves a plan to connect the Cogswell Interchange with a pair of one-way streets: a three-lane Hollis Street southbound to Sackville and a two-lane Water Street northbound. Prospective traffic volumes are a concern. The plan means several metres would have to be demolished off the fronts of three historic buildings on Lower Water Street, opposite Morse’s Tea House. 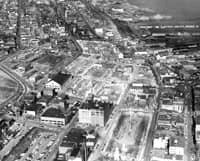 In addition to the 5.6 hectares of land cleared in the early 1960s, the city begins demolishing buildings on nearly five more hectares of land to make way for the Cogswell Interchange. The plan involved the destruction of about half a dozen historic buildings. City council votes in favour of spending an additional $21,000 (roughly $132,670 in 2013) to relocate several sewer trunk lines. That about-face means the fronts of three historic buildings on Lower Water Street are saved. 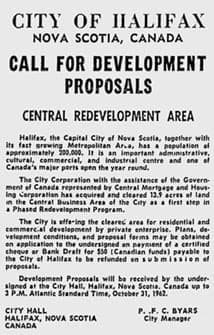 Courtesy of The Chronicle Herald - October 18, 1968. Anne Fraser was one of the people who worked to stop the Cogswell Interchange and the Harbour Drive highway in the 1960s. Here, she speaks to reporter Pam Berman about how Haligonians fought to preserve the waterfront. Demolition is complete and construction begins on the Cogswell Interchange, Scotia Square and Cogswell Tower on land expropriated through the Canadian Mortgage and Housing Corporation. Scotia Square opens later that same year. 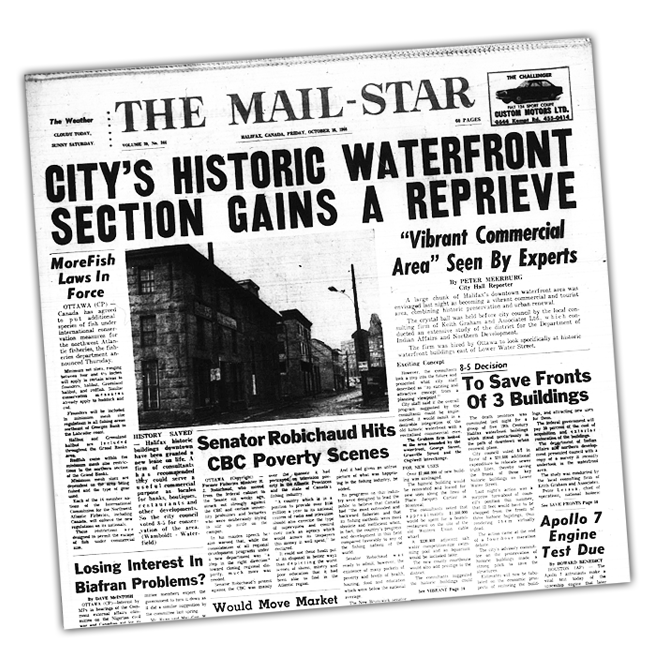 People opposed to the Harbour Drive proposal had garnered so much public support for their side that the project is terminated after the completion of the Cogswell Interchange. Alan Ruffman, one of the citizens opposed to the project, talks about the battle of Harbour Drive. that the interchange was originally meant to connect to the core. Lessons from the Waterfront: Mainstreet host Stephanie Domet talks to Colin MacLean, President and CEO of Waterfront Development Corporation Ltd., about how that organization came about because of the end of the city's plans for Harbour Drive, and how what's under the Cogswell Interchange might affect what can go on top. 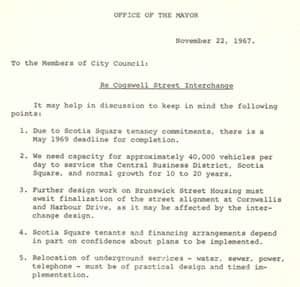 The Mayor of Halifax, Walter Fitzgerald, muses about getting rid of the Cogswell Interchange. He calls it “ugly looking” and complains that it uses a large chunk of valuable land. “You just can’t use expensive land in a downtown setting to create overhead structures that aren’t really necessary,” he says. See CBC reporter Phil Forgeron's report on the talk of getting rid of the Cogswell Interchange. A conference of the Canadian Association of Planning Students holds a design charette on redeveloping the Cogswell Interchange. A charette refers to a collaborative session in which a group of designers drafts a solution to a design problem in a short period of time. The winning concept of the Canadian Association of Planning Students charette included a greenway connecting the Halifax Common to the harbour, thus strengthening the view of the water and access to the harbour. The Downtown Halifax Business Commission, the Halifax Regional Municipality and the province of Nova Scotia release a strategy called the Barrington Street Strategic Plan, which calls for a comprehensive approach to rejuvenating the downtown area. The report says the Cogswell Interchange is redundant and recommends a detailed study be done to redevelop the area. The Cogswell Interchange Project Team is formed with staff from the municipal departments of Transportation and Public Works, Planning and Development Services, Real Estate and Tourism, Culture and Heritage. The group’s goal is to examine the feasibility of redeveloping the Cogswell Interchange area. The Halifax Regional Municipality commissions Vaughan Engineering Limited to study the Cogswell Interchange and discuss design alternatives, traffic impacts and planning issues. The main question was whether essential traffic and roadway services could be provided with a road network on one level, rather than the multiple levels of the Cogswell Interchange. The report concludes it is feasible to remove the Cogswell Interchange and still have traffic flow efficiently into the downtown area. See the design alternatives in our Where We're Going section. George Jordan, the host of Mainstreet, speaks with Kate Carmichael, the executive director of the Downtown Halifax Business Commission. 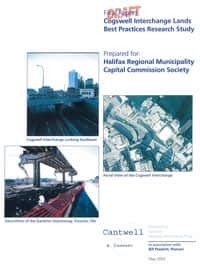 The Halifax Regional Municipality commissions Cantwell & Company to study the planning process associated with removing the Cogswell Interchange and to determine whether the project is financially feasible. The report studies highway demolitions across North America and concludes the redevelopment of the Cogswell Interchange lands is financially feasible and self-financing through the sale of land and increased property tax assessments. 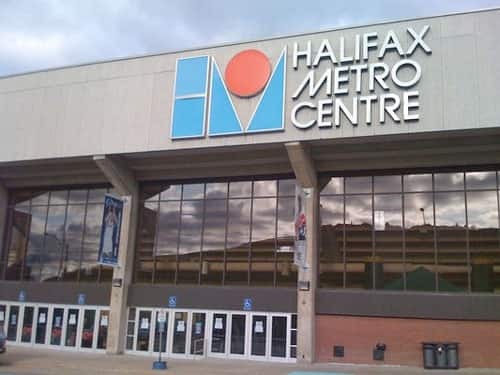 The regional plan released by the Halifax Regional Municipality identifies the Cogswell Interchange lands as a redevelopment opportunity site. HRM By Design releases its Downtown Halifax Secondary Municipal Planning Strategy, in which it names the transformation of the Cogswell Interchange one of the 10 aspirations for a widely agreed upon vision of what downtown Halifax should look like in the next 25 years. 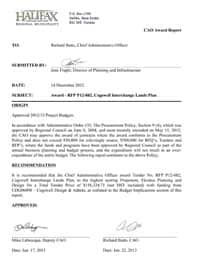 the Urban Design Project Manager for the Halifax Regional Municipality. The Halifax Regional Municipality issues a request for proposals for a technical analysis of the Cogswell Interchange site, including the transportation, engineering, urban design and financial requirements. Ekistics Planning & Design wins the contract. The report is expected in the fall of 2013. 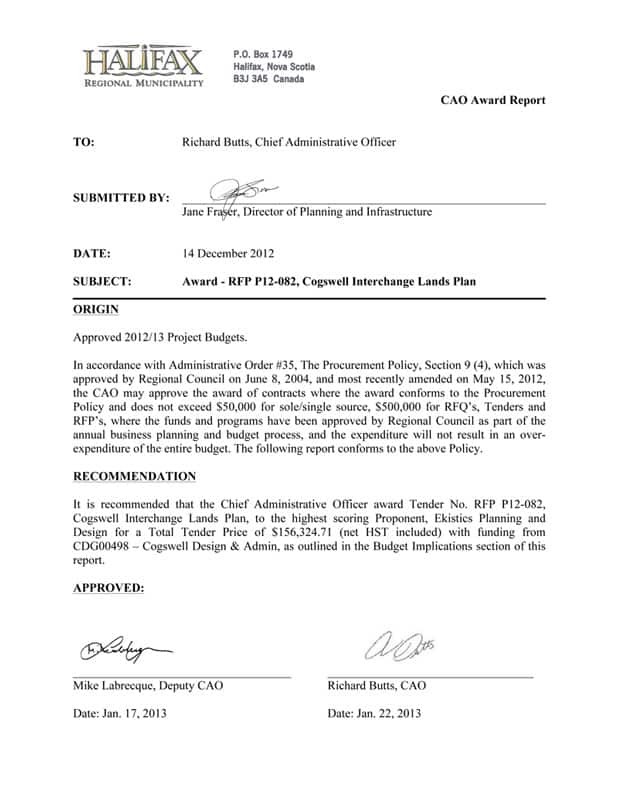 CAO Award Report - The complete document is available here. Hundreds of people attended a meeting on May 16 in Halifax to talk about what might replace the Cogswell Interchange. 1. The Master Plan, which will outline how the Cogswell Interchange comes down and what replaces it. 2. A market assessment which looks at the costs, the potential revenues as well as the economic impact of redeveloping the Cogswell lands. 4. A summary of what the public would like see -- including what was said in last spring's Cogswell Shakeup session. Do you have an idea for what the Cogswell Interchange could look like? Or feedback on what's been proposed? We want your opinions.